aimm members gain access to market intelligence, enjoy business to business connection opportunities with over 1800 industry contacts and network with the leading companies in the micropayments sector. 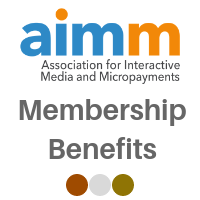 One of the core benefits of joining aimm is our representation of our members’ commercial interests in the Interactive Media Industry. This is not only through representing members’ interests to Government and regulators, but also facilitating member working groups and forums to identify barriers to, and opportunities, for growth. aimm has several working groups that bring together the interactive media value chain, often with a particular sector (e.g. Broadcast, Digital Marketing, Charity, Mobile and Charge to Bill) to prioritise issues that will drive Industry growth and members’ revenues. Whatever level your business is at, we have a membership level to suit your needs. If you are interested in becoming a member and joining our other interactive media companies simply complete the application form below. Want to learn a bit more before you commit? Simply get in contact with us using our CONTACT FORM and a member of the team will be in touch. In addition we are now offering rewards through our Member get Member scheme! Members can get up to 10% of the new member’s annual fee when the company that you recommend joins! The more new companies you introduce the more £££ (in vouchers) you will receive if they join! For more details please see attached information leaflet: aimm Member get Member scheme information. If you are interested in becoming a member of aimm, just simply complete the Application Form below and we will be in contact. If you have any questions about membership or the recent work that aimm has done please contact us.